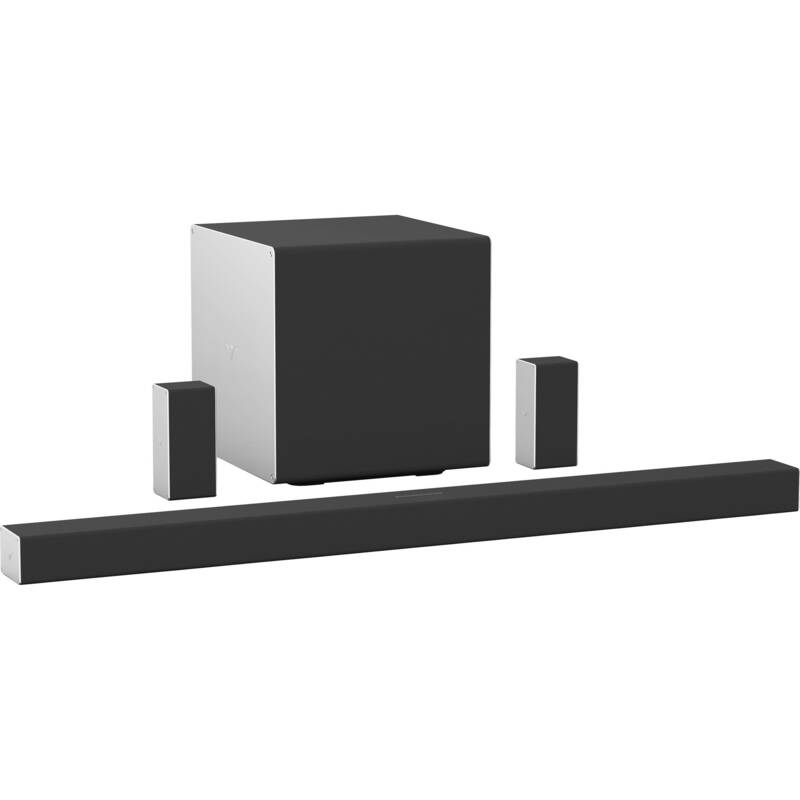 Enhance your display's audio with the VIZIO 46" 5.1.4-Channel Soundbar System. It features a soundbar with left, right, center, and two up-firing drivers, plus two satellite speakers that each have an up-firing driver, and a 10" wireless subwoofer for low bass impact. Its ability to decode Dolby and DTS signals, including Dolby Atmos, is designed to provide an immersive surround sound experience with compatible content. This soundbar system has Bluetooth connectivity for pairing with your compatible smart device and wirelessly streaming your audio content. Its wired connections include HDMI, optical, 1/8", and digital coaxial inputs to support a variety of source types. The soundbar also has a USB port for playback of WAV files. Its HDMI output is ARC-compatible, so you can hear display-based audio from built-in apps like Netflix and YouTube. It includes a remote control and can be integrated into your Google Assistant ecosystem. 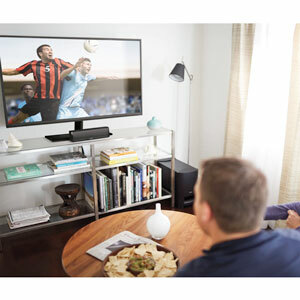 Upward-firing speakers built into the soundbar and satellite speakers, along with Dolby Atmos decoding, help provide a fully immersive experience with compatible content. To help you avoid running wires from the front of your listening room to the back, the subwoofer connects to the soundbar wirelessly. The subwoofer then outputs directly to the surround speakers with wires. Stream your favorite audio to the soundbar wirelessly with Bluetooth or Chromecast built-in. Integrate the soundbar system into your Google Assistant ecosystem and use your voice to adjust the volume and perform other tasks. Box Dimensions (LxWxH) 47.5 x 22.0 x 16.0"